NPU = Nice Part Use in the Lego world. One chief complaint in the Lego community revolved around unique large parts (elements) that leave little to the imagination. This was especially true in the mid-late 90s when Lego was floundering. They released sets with fewer elements and more specialized parts that enthusiasts found hard to leverage into their MOCs (My Own Creation). But there are builders out there who only see this as a challenge to be proven wrong. This is a great example of NPU. 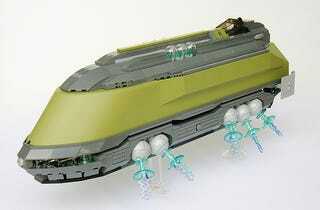 The olive green ship haul seamlessly forms the body of an entirely new kind of ship. A bit like Jaba's Sailboat in my mind or something from Dune. I love seeing stuff like this where a useless part reverses course and becomes inspirational.